Reports indicate that the Kindle-maker may be opening a new kind of pick-up facility in California. Still, perishable goods present several challenges for the e-commerce giant. Amazon.com (NASDAQ:AMZN) is launching its latest initiative to bring groceries to your door, this time with a little bit of your help. According to Silicon Valley Business Journal, the e-tailer is in the process of opening up an 11,600 square-foot space for grocery pick-up in Sunnyvale, California. Amazon has not confirmed the news, but sources say that the company is planning similar sites around the Silicon Valley area. 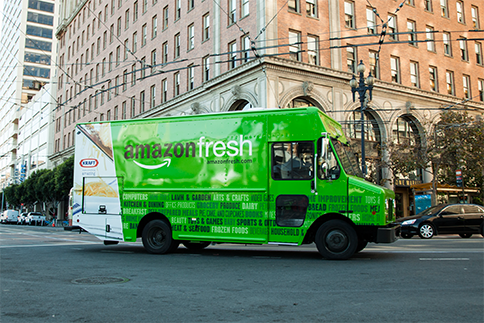 If true, the move would mark a departure from -- or perhaps a complement to -- AmazonFresh, its service that delivers groceries directly to customers' homes in a number of metropolitan areas. But Amazon has ventured into brick-and-mortar commerce on occasion. During the holiday season it has opened pop-up stores in malls to showcase its Kindle line of tablets and e-books. It has also begun opening pop-up lofts in cities such as San Francisco and New York to promote its cloud computing platform, Amazon Web Services. In some ways, the grocery pick-up program would resemble the Amazon Locker program, which allows customers to have goods delivered to unmanned storage units in convenience stores like 7-Eleven. Amazon has also always tried to deliver the utmost convenience for the customer: the essential value proposition of e-commerce. Having customers pick up goods after ordering them online seems to be less convenient than delivery. Without the right execution, the process could be even more difficult than simply shopping at a standard grocery store. Amazon long ago mastered the business of selling electronics and media products, and the company's leverage in other areas of retail is fast improving. By the end of the decade, Amazon is expected to be the nation's largest apparel seller, and earlier this year it launched Amazon Home Services, putting household and handyman tasks such as cleaning and TV installation under its umbrella. Groceries have always been a thorny area, though. Since the category includes perishable items like dairy, produce, and meat, delivery is much trickier. Amazon has made no secret of its aspirations in groceries, though. In addition to Fresh, it's experimented with making its own diapers and other household products. CEO Jeff Bezos believes that the frequency of food shopping makes it key to the company's e-commerce growth as it holds the power to drive other purchases. The grocery business is also huge. With U.S. grocery sales estimated at $643 billion nationwide for 2013, only general merchandise is a larger retail category with sales at $653 billion. Amazon's rivals like Wal-Mart (NYSE:WMT) generate more than half of their sales from groceries, meaning Amazon's sales would double if its grocery department had a similar product mix to those retailers. Amazon took its time developing Fresh, honing it for six years in the Seattle area before expanding it to cities like San Francisco, New York, and Los Angeles. The service does not come cheap, at a price tag of $299/year (which also includes access to Prime). Amazon is notoriously mum on its own internal figures, but the impact of Fresh seems to be minor compared to some other growth segments like Prime and AWS. The lofty price tag may turn off consumers as well, which could explain why the company is experimenting with in-person pick-up. Can this pick-up system work? Amazon isn't the first company to test this kind of pick-up system. Surprisingly, Wal-Mart introduced a similar concept near its headquarters in Bentonville, Arkansas, offering customers the ability to order groceries online and then pick up from the facility in as little as two hours. Wal-Mart has expanded the platform to a handful of other cities, including Denver and Phoenix, and management has said they are delighted with the results so far. Unlike Amazon, Wal-Mart has the advantage of attaching such pick-up sites to regular stores. For Amazon, success in groceries won't come easy. The company may be able to grab the customer who values convenience over price, but the industry's narrow margins, heavy penetration, and high competition -- as well as the complications of delivering perishable products -- make it more challenging than ordinary e-commerce. Of course, Amazon has proven the conventional wisdom wrong more than a few times. Still, its future success will probably come from profitable, high-growth divisions like AWS, rather than groceries, where it still faces several headwinds to a large-scale rollout.